Ed Dentzel is the host of the missing persons program, Unfound. He’s covered over 120 disappearances including Flight 370. However, before devoting his life to helping missing persons families, he was the Stage Manager for “The World’s Greatest Magic Show” at the Greek Isles in Las Vegas from 2005 to 2008. While there he worked with more than 50 magicians, helping them create and hone new tricks. I asked him: given his experience in devising magic tricks, what does he think of the idea I laid out in The Taking of MH370 that the disappearance could best be thought of a stage magic–does the disappearance match with the way a magic trick would be crafted? This is an edited version of the reply he sent me. I do see a lot of similarities. And I think you’ve touched upon a few of those qualities without possibly knowing it. First, every magic trick is tailored to the environment in which it will take place. In other words, there’s a reason at a child’s birthday party you don’t see a magician cutting a woman in half. Why? Because to do that trick, the audience can’t be “on top of” the magician. If the audience is too close, then the trick is exposed. Also in other words, the simpler the trick, the more it can travel from a stage, to a convention room, to a home. Card tricks are probably the best known of this kind. How does that relate to Flight 370? Well, if things happened the way you’ve written, the “trick” couldn’t have been performed over the USA at noon on a Wednesday. Why? Other jets would see Flight 370 leaving its path. People on the ground would see it. Military and civilian radar would see it. Instead, these hijackers picked the correct venue for their trick: Southeast Asia, where things are a little lax, especially at night. Second, every trick has a tell. Not because the magician wants it that way. But because there is no easy way to make things seem possible that are truly physically impossible. What do I mean? Well, a magician can’t make birds appear out of nowhere if he is naked on stage. So, her costume/his suit/those pants are not something you’d pick up at the Men’s Warehouse. Those are specially designed clothes for that bird trick. 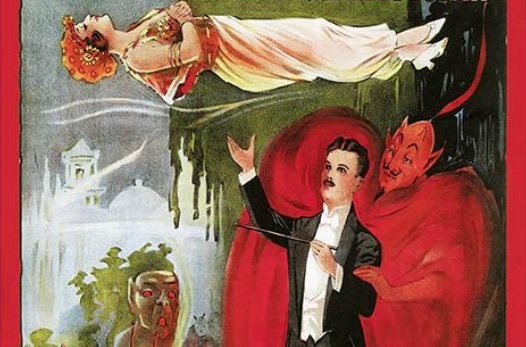 Likewise, in almost every levitation trick out there, there’s a reason the magician drapes a piece of cloth over the entire assistant before she is suspended in the air. Why? Because that’s to cover the woman sliding into the table she is lying on, and what the cloth is really covering as it goes into the air is a wire frame suspended by wires. But, to the audience–the magician’s clothes, the draping of the assistant, etc. appears to be very natural and unassociated with the trick itself, even though it is. Maybe the best example is when David Copperfield walked through the Great Wall of China. Great trick. Yet, the tell was right in front of everyone the whole time . . . why exactly did he use the same platform and shrouding on one side of the Wall, then the other? You mean a rich guy like that couldn’t afford platforms for both sides. Well . . . it was because he was hiding in the platform and thus got carried by his assistants from one side of the Wall to the other. How does that relate to Flight 370? Well, it may be that the SDU cutting out and coming back on is that “tell.” And you’ve kind of explained it as such. To seemingly everyone else in aviation, this is just some natural thing that occurred. To you, it’s the “tell” that a “trick” was taking place. And like the magic tricks which need the special costume or the draping of the assistant, the taking of Flight 370 couldn’t have happened without the SDU going off then on again. Third, magicians never reveal their secrets. Yes, once in a while a TV show comes out, “The World’s Greatest Magic Tricks Exposed.” But I can tell you, in my four years of working with magicians, not one ever complained about a show like that. In fact, all of them know the Masked Magician who was in those shows–his identity is not a secret. Why? Because most of the tricks featured on those shows were old–they’d already been outdone or revamped. Why? Because magicians love to one up each other. They are very competitive. So, even when it seems a magician is showing the world the secrets, he really isn’t. How does that relate to Flight 370? Well, nobody has taken credit yet. Yes, you suspect Russia–but nobody has come out and said, “We did it. And here’s how we did it.” True, it may be because the repercussions of doing that would be severe, especially if all of the passengers are dead. However, if the taking of Flight 370 was a more, uh, private operation, then the culprits are behaving exactly like magicians, not even going to some place like 4chan or Reddit anonymously to say how they did it. Yet, what this also means, distressingly, is someone or a group could right now be planning to outdo what happened to Flight 370. Maybe the next time will be a flight over the USA. Or over Europe. Some “magicians” will figure out how to make a plane vanish without the help of a wobbly satellite and the SDU. So, I see a lot of similarities. However, I see some dissimilarities as well. 1. The hardest thing to make disappear is an inanimate object. Why? Because they can’t be trained–they have no intelligence. A human, a tiger, a rabbit–they can all be trained to slip into this table, crawl into this hat, jump through this hoop of fire at the appropriate time. But an inanimate object will just sit there until acted upon by the magician herself. What does this mean? Most inanimate objects you see disappear during a magic act are not real–they are all magic props. That bird cage–not something you’d pick up at PetSmart. That bottle–not something you’d drink Coke out of. That 15lb. oak wood table that is being levitated–it’s really made out of balsa wood and weighs 2oz. Well . . . Flight 370 was a real plane and a large inanimate object. 2. Magicians and the stage personnel always have outs if something goes wrong. If that drape that’s on the wire frame gets snagged when the magician tries to rip it away, we pull the curtain so as to protect the trick and the magician’s reputation. If a gadget, a little machine that is being used during a trick doesn’t work–the batteries have worn out,say–we’re prepared to give signals to the magician that she is going to have to skip that part. If an animal is just in a bad mood that day and it could be a danger to the crew, the audience or the magician himself, we nix that trick for that day and work around it. Well, with Flight 370 we still don’t know what the “out” was if their trick didn’t work. In fact, I’m not sure anybody has thought about that. Or . . . was this “success or suicide”? 3. No magician would ever craft a trick that had the possibility of being solved just through logical reasoning. As much as Vincent Gambini from My Cousin Vinny might’ve been able to solve any trick in seconds, in real life that is not how it works. In fact, if you’re a magician and all of your tricks can easily be figured out just by people thinking about it for a few minutes, you don’t have a job. Well, what I’m saying is it seems you’ve figured out this trick through logical means–crunching the data and the facts. Now, it may be that the hijackers didn’t know about the BTO. And because of that you’ve kinda worked your way “behind the curtain” of the trick. But surely a bunch of “magicians” who could figure out they could use a wobbly satellite to take a passenger jet, would find out, even by accident, that there was another way to track Flight 370 besides the established procedures. Keep in mind, the people at Immarsat said they’d never tracked a plane using the BFO or BTO before. Well, that doesn’t mean somebody else hadn’t figure out how to do that years before and kept it himself. Which is also a common thing in magic–sometimes it takes years for a trick to come fruition, and all that time the magician keeps it to himself till he can figure out the particulars because he doesn’t want anyone ripping his revolutionary new trick off. I do have something for you to think about: How truly convenient is it that the opposite path of the one that leads down into the Indian Ocean, happens to lead to a remote airfield in a country that is friendly to Putin? What I’m saying is imagine a different scenario. Imagine that the alleged path still led to the southern Indian Ocean but the opposite one led to, say, Switzerland. Well, the path to Switzerland could easily be dismissed and the Indian Ocean path would have to be accepted despite the jet not being found there yet. Likewise, let’s say the alleged path of 370 led to the center of Australia (and not the Indian Ocean) and the opposite led to Kazakhstan, which of course it does in reality. Well, as soon as the center of Australia would be checked and there was nothing there, everybody would know that the jet went to Kazakhstan. What I’m saying is under those alternate scenarios, the hijackers plan doesn’t work — the trick is exposed. And I think you know this but I don’t think it’s been obvious in your writing to this point. Let me try to explain it another way. The reason YOU personally believe that the plane went to Kazakhstan is NOT because of your beliefs regarding Putin–although those are well-warranted. The reason YOU believe it is because Kazakhstan is on the opposite end of the arc from where the Southern Indian Ocean is–and you know that from the data you have personally crunched. You DID NOT just haphazardly pick Kazakhstan out of the air. Well, we must look at this from the hijackers POV. Nothing would’ve been stupider for them than if they flew to Kazakhstan, did all this stuff with the SDU, BUT . . . the path shows that instead of crashing into the southern Indian Ocean in the middle of nowhere, that 370 actually crash landed in the center of Tokyo. You know what I mean? So, the hijackers needed to get 370 to a point on the globe–the end of the Malacca Strait–where the opposite route to Kazakhstan would lead investigators to the most desolate part of the earth where the searching would be the hardest. Meaning, the southern Indian Ocean path was not accidental—it was built into the trick. It’s not a coincidence that it looks like 370 went into the Indian Ocean—that is EXACTLY what the hijackers wanted everyone to think. Well, to do that, they needed to get to a particular point on the globe to make it work. The flight up Malacca Straight was the “show” setting up observers to go down the rabbit hole of the SIO. Interesting angle and insight from the magician. Please help me understand if the satellite data was spoofed, why could the plane only in reality go North or South along the spoofed route? Wouldn’t spoofing imply the airplane could be anywhere within range of the Inmarsat satellite? If some parameters could be faked, why couldn’t all be faked? @George Dawson, There are two components to the satellite data, the BFO and the BTO. I have a chapter about each one in my book. Basically, the BFO should be fairly straightforward to spoof, and a perpetrator would have reason to expect that Inmarsat would be logging the data. The BTO is significantly harder to spoof, and perpetrators likely would not know that Inmarsat had only just started logging the values for the first time a few months before the disappearance. It’s the lucky break of having the BTO data that lets us plot a route to the north. Magic utilizes Misdirection. Nice add to Jeff’s all encompassing work. Thanks Jeff for the explanation and for keeping this topic alive for 5 years. A British laboratory has found “traces of explosives” in samples from a Polish presidential plane that crashed in Russia in 2010, according to a report. The findings by the Forensic Explosives Laboratory (FEL) appear to challenge official reports by Russian and Polish investigators that blamed pilot error for the crash, which killed 96 people, including then-Polish President Lech Kaczyński, near Smolensk, western Russia, in April 2010, Poland’s Sieci weekly has reported. …Around-the-clock channel Sky News last year quoted a British air accident investigator as saying that he believes there were explosions on board the Polish president’s Tu-154M plane before its fatal crash in 2010. …In April 2017, the Polish commission said that the presidential plane was probably destroyed by a mid-air explosion and that Russian air traffic controllers deliberately misled Polish pilots about their location as they neared the runway. I’m still not convinced that if MH370 flew north, it had to land in Kazakhstan, as opposed to a nearby country, such as China. Can you explain why it had to be Kazakhstan, to the exclusion of all other countries? @CliffG, Interesting report, not very credible sources alas. @Rodney Small, Australia’s Defense Science Technology Group (DSTG) developed an analytical method based on Bayes’ Theorem that allowed them to calculate the probability of a plane’s path based on the BTO values alone. The probability heat map lay within Kazakhstan. That’s not to say that it’s impossible that the plane went to China. It could have. Remember, though, that China was where the plane was going originally. Let’s try another source, the respected Daily Telegraph. Back in 2017 the initial contract was given to the FEL (UK) to conduct tests for explosive residue on the debris. Now, in Mar 2019, we have a Polish source claiming that the results are in, and they prove that there was an explosion on board the aircraft. Very interesting post. I have read both books and am very intrigued by the plane went north theory. This supports the theory. Thank you for your work. As far as the theory proposed recently on your site ( not by you) that it’s the Russian oligarchs that did it due to Malysian bond issues … could they hire the right people to pull this off? Always found it odd that the hypothesis you are considering is supported by the the fact MH370 was untraceable other than by the SDU, which was rebooted and presumed to be reprogrammed to send false signals to inmarsat. If MH370 was otherwise untraceable, why has no one contemplated the scenario that rather than the SDU on MH370 being rebooted, could there not have been another aircraft in flight to simulate the SDU pings that was coordinated with the MH370 SDU being shut down; and this new craft coming back online after a “reboot” and simulating the flight into the Indian ocean thus leaving MH370 an otherwise untraceable MH370 to fly virtually anywhere under cover of night? Just a thought and sorry for the run-on sentence. @AJ, That idea has certainly been discussed. Such a scheme would be more difficult to pull off and require more resources, but is certainly conceivable. That’s a really good question. As JW concedes, yes this is certainly conceivable. You will find people (like myself) who think along your lines and regard it as far more plausible that this SDU sequence is ‘the’ tell in this mystery and is due to the signals being sent from a different device than the one on mh370 after the reboot. You mention the possibility of a second plane, also it has been proposed that the signals could have been sent from a ship in the Indian Ocean spoofing the ‘rest’ of the ‘flight’. There are no radar sightings that could not have been mistakes or hindsight misinterpretations of artefacts or other flight objects. Only the mobile phone log on by the co-pilot seems unclear in this scenario, and even here it’s conceivable that either the co-pilot had given his phone to someone else, or if could have been stolen before in order to corroborate a “western path”. In any case, why assume that the plane was abducted in such a complicated, involved scenario as JW’S, with debris planted etc etc, but completely disregard the (relatively speaking, minor extra step) of the possibility of either a second plane or ship and the data being spoofed entirely? Especially since apart from the SDU data – which is assumed part-spoofed even under the Kazakhstan scenario – nothing in particular points to Kazakhstan except American’s love-in with the archetype of The Russian Perp. Thanks Jeff for keeping up your tireless investigation of MH370. I find your articles so intriguing and wanting for more. Something very evil happened to that plane and I support your “flying north” hypothesis. I look forward to the day when we finally have the answers to this great mystery. My thought about MH370 from the beginning was that it was likely hijacked by a group alienated from its government who were desperate enough to risk such an extreme action. My prime candidate was the Uighur people of the Xinjiang region in northwestern China, and I still don’t think they can be ruled out. @havelock in that scenario where did the spoof data source plane go after it had finished creating the trail? Would it have had enough fuel to get anywhere on land and if it did, wouldn’t it have been seen when it did? How big would it have needed to be to be able to fly that route? @ Crobbie personally I’m more inclined towards the theory “spoof SDU on a ship in the Indian Ocean “, I’m not the expert on the spoof plane theory. A key thing with that theory is who you assume as the perp. Those theories all effectively imply a state actor of adequate resources and will. Of such there are not so many around. A spoof plane could, for instance, have flown the described route, then via Myanmar (back) to China. Fuel is no issue with this route. As to how big it would have had to be, a jet, but smaller so it doesn’t look too big on radar if seen and doesn’t get intercepted. Mind you this is purely my educated guess. Just putting one more theory out there. I want to use this opportunity to join the others in thanking JW for keeping the memory and the search alive and also for writing such a fantastic book on the matter. @Havelock, Thank you, I really appreciate it. Sorry Jeff, but this only reminds me of the ABC drama “Deception” (an illusionist actually had a plane disappeared to fool the FBI), which might be based on reality to some degree, but at the end of the day, is still not reality. As far as I’m concerned, there’s zero hard evidence to support your spoofed-SDU theory. Every “evidence” you have listed can also have other explanations. @AJ, I have written comments about a potential connection to oligarchs, other sovereign funds and 1MBD. There are a number of potential alliances and (perhaps not) coincidental meetings that had prompted the thinking. But in my mind the oligarchs would have acted less independently and more as agents of the Kremlin, as they tend to do (at least those who haven’t been run off, jailed or assassinated). I don’t recall if it was Oleg Deripaska or Roman Abramovich but one of them–and I’m paraphrasing–said, the state and I, there is no difference. Unfortunately, I cannot find the citation, but it is out there, and it makes sense as their wealth and approval serves Vladimir Putin just as his military and approval protects them. In fact, it was Abramovich who recommended to Boris Yeltsin that Putin succeed him and who recommended to Putin that he elevate Dmitri Medvedev to the presidency when Putin temporarily stepped down. In this scenario, Russia is essentially a mafia state, existing for the enrichment of the few of its members, and certainly the scandals, law suits, accusations and ongoing assassinations suggest it is that as much as a coherent lawful nation as the West would understand it. And there the oligarchs serve a very useful function for the Kremlin, geopolitically. They provide a plausible deniability for Putin, doing the dirty work just as an underboss in La Cosa Nostra would. Certainly, we know how the Kremlin uses plausible deniability as a tool to achieve its ends–irregulars in Syria, irregulars in the Donbass, irregulars in Venezuela, the GRU created Internet Research Agency feeding information to Alfabank servers communicating with Trump Tower servers and so on. Given all of that, given a record of exile and killings and underhanded dealings even between Russians, would it seem so odd if certain Russians whose money in a Middle East fund invested in a Malaysian fund had gone missing would seek its return? That wasn’t AJ’s question. AJ didn’t ask for another expose of American’s love for The Russian Bogeyman but rather asked whether the SDU log on log off could have been the result of mh370 SDU being switched off and then a spoof sender on another plane being switched on. This seems possible and somewhat plausible as even JW has admitted. It would make a Kazakhstan route less likely and open up the possibility of different routes. @Havelock, you’re right, of course, thank you, and to be clear I have no lover whatsoever of the Russian bogeyman. Nerve agents and radioactive poisonings and falling from windows, not to mention decimating cities, creeping invasions, outlawing homosexuality and crushing women’s rights, shooting down civilian airliners, disrupting the Western social democracies that have brought progress to much of the world and encouraging doubt in global warming for new trade routes and access to unlocked natural resources at the expense of millions of lives is nothing at all to love. @ Mark, see my comment of March 27 in answer to your question at March 27 11:33 pm. @ Rodney Small, the Uighurs, who I sympathize with, have been accused of and punished for two hijackings, though both are questionable. That said, they were on domestic flights and, if authorities are to be believed, involved no technology other than matches and men. Knife attacks, generally directed at Han Chinese officials preoccupied with denying them a homeland, are more their speed. Unfortunately, that appears to be a losing strategy. Interesting. If done on purpose, re-logging the SDU with tweaked data was possibly a way to direct the search towards a wrong place while looking as a credible path. if not the case, the question remains what would have triggered the re-logging of the SDU, accidentally. If this accidental re-logging can be discarded, then remains the on purpose one. Letting believe that this was accidental may also be part of the trick if possible. Your are right. The day on which MH370 is found will confirm it. @haxi, You write, “Every “evidence” you have listed can also have other explanations,” and that’s surely true; but from the constellation of these alternate explanations, can you piece together an assemblage that collectively fit another coherent explanation? Which is to say, what is your alternate explanation? If your only response is “we’ll never know” (a response I have certainly heard from others) I would have to say: what is it that makes you unwilling to even acknowledge the possibility that this scenario is correct? Another way of putting this: You object that my spoofed-SDU scenario has not been proved beyond a reasonable doubt. But that is not the standard I am aiming for. I am just trying to come up with an explanation that fits the data in hand and makes any sense at all. I absolutely agree with JW. Saying ‘we’ll never know’ and ‘every evidence can have other explanations’ is disingenuous in a very nihilistic way. We do know quite a bit, and there is a very limited number of coherent theories fitting the evidence. If you actually wanted to say that some pieces of evidence are fairly indisputable and some not so much, that of course is true. But the fact that something sent transmissions to the Inmarsat satellite, for example, is indisputable except if you propose a conspiracy involving Inmarsat lying about this. However, even then the fact that Inmarsat went public with this is information and as such not in doubt. @all, Closing comments here, please add your contributions to the most recent post. Thank you! Next Next post: New York:Is the Boeing 737 Max Worth Saving?